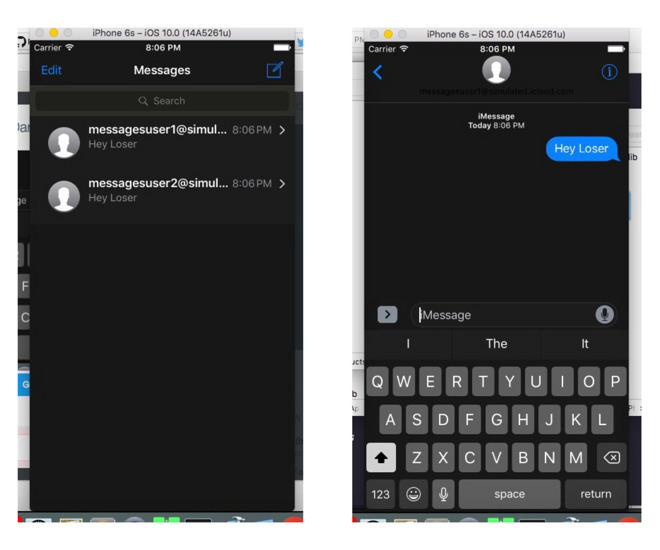 The iOS 10 version of Messages appears to contain a hidden "dark mode" option, potentially backing up hints that such a feature will go system-wide, or at least come to other iOS apps beyond ones like iBooks. There appears to be a way of turning on the setting in Messages when running an iOS 10 simulation on a Mac, developer Andrew Wiik noted on Twitter. He added that he doesn't think Apple is finished with the technology, although in its current state it's still said to be "app wide." Earlier this week, a number of AppleInsider readers observed that asking Siri to turn on "dark mode" resulted in the voice assistant saying that it's "not able to change that setting," instead of offering a more generic response like "I don't understand." If Apple is planning to make dark mode a feature in Messages or elsewhere in iOS 10, it will presumably activate it in later betas, much as it did with Night Shift in iOS 9.3. Whereas Night Shift simply skews iOS device screens to warmer tones, a true dark mode would reduce eye strain at night —or in dim rooms —by turning white backgrounds black, and darkening or inverting other interface elements as needed.